Safely and efficiently restoring property to its pre-hoarding condition is a difficult task. Mastertech’s professional hoarding cleanup services help relieve the burden for family, friends and those closest to the situation. At Mastertech, we are provide a sensitive and concerned atmosphere at the cleanup scene. They may have concerns or may simply need a friendly face or some words of comfort. Our staff understands the shock and grief they are feeling, and responds with respect, discretion and genuine concern. Easing both the mental and physical burdens of hoarding cleanup, we are proud to partner with home and business owners in need of compassionate, skilled property restoration. Many of our Clients stumble upon or inherit homes that were once owned by a hoarder. Sometimes, life gets out of hand and the only control some people have is to hoard things of no value. Some hoarders collect things while others hoard animals. Either way, a professional hoarding cleanup can be the starting point to recovery. 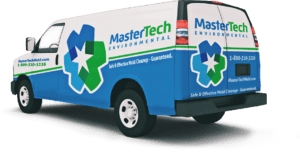 As one of New Jersey’s Top-Rated Hoarding Cleanup Companies, Mastertech can turn your distressed home or business into a clean, disinfected and most importantly – livable space. Discreet and professional cleaners for hoarders are available from Mastertech. While we can handle the actual cleanup, we can also recommend help in the form of counselors or doctors. Often time, people who hoard get overwhelmed by the problem they have created over time. They avoid letting friends and family in as their situation grows. Letting them know they are not alone and that help is available is sometimes just what they need. All of Mastertech’s professional cleaners for hoarders are trained to be compassionate and discreet during difficult hoarding cleanups. In many cases there may be bio hazards, odors, pet feces, human feces and a host of other issues – many of which may be harmful to human health. Mastertech’s professional technicians are trained to handle even the worst cleanup situations and will do so discreetly and with compassion for the homeowner or family members. If you believe you have a hoarding situation that requires professional attention, the Mastertech Team is here to help.